Now you can perform amazing mindreading magic with a Rubik's Cube theme! 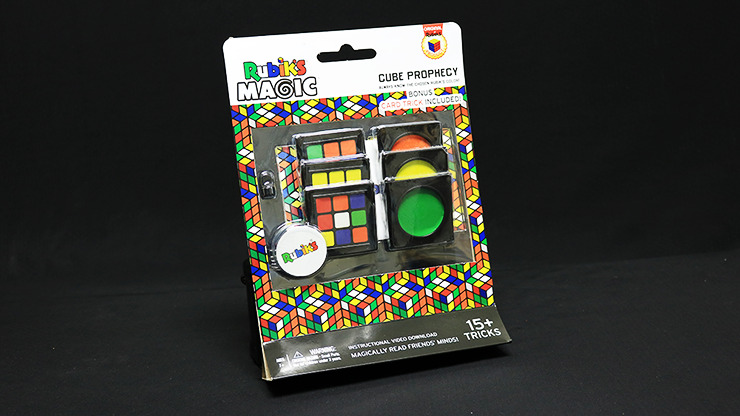 Rubik's Prophecy: Six different plastic plates are shown, each with an illustration of a scrambled Rubik's Cube on the front, and one of the colors of the Rubik's Cube on the back. A spectator randomly chooses one of the plates, yet the magician brings out an envelope that predicts the chosen color chip! Rubik's ESP Cards: A card is shown to feature a scrambled Rubik's Cube. A spectator secretly chooses one of the colors, but the magician guesses it in a miraculous way! 15 great feats of mentalism are included! Buy yours today!